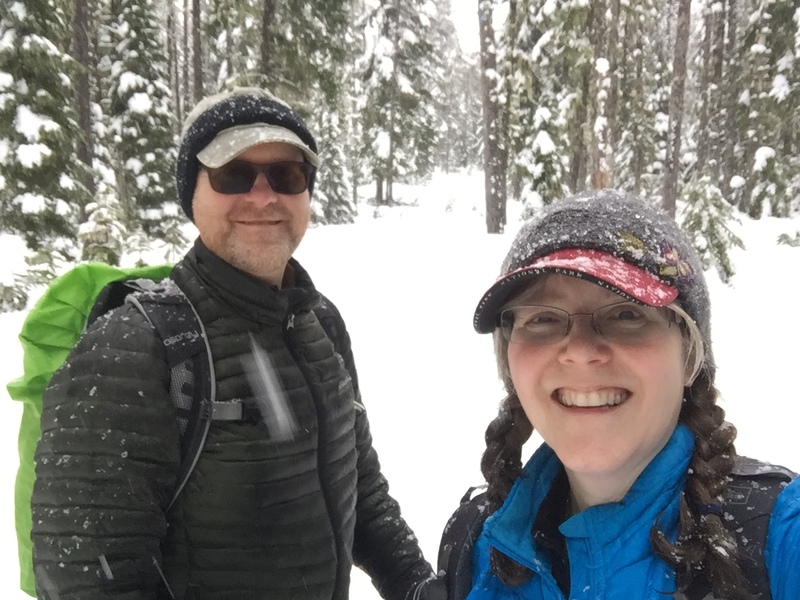 In 2013 we wrote a post about snowshoeing, saying you should hold us to our promise of snowshoeing more in the coming years. I am delighted to say that we have stuck to that promise and snowshoed quite a few times since then. Just a few weeks ago, we got up to Government Camp on Oregon’s Mt. Hood and snowshoed the Crosstown Trail. It had been snowing all week and continued the day we were there, making for a gorgeous day in the woods. One of the things we love about snowshoeing in Government Camp is that we can take the Sandy Mt. Hood Express bus up there for $4, round trip. 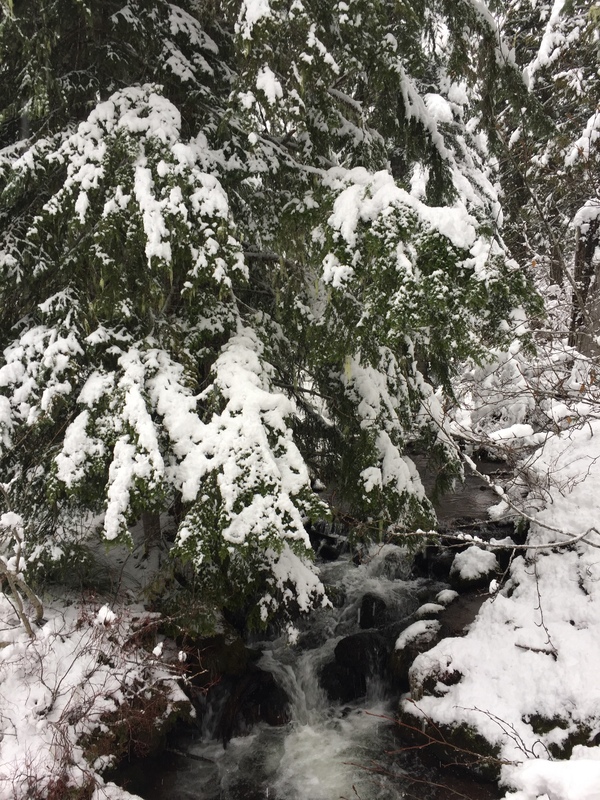 Sandy is an easy one-hour drive from downtown Portland and offers free parking (and no messing with tire chains or sno-park passes!). We love catching the bus from there! In 40 minutes or so, we hop off and are on our merry way. We’ve done the Crosstown Trail twice now, and both times we’ve started from the Summit ski area on the far east end of town (the bus stops at the Chevron station). Depending on how hard you want your workout to be, you could also start on the west end of town, but the trail goes gradually UP from that end, so it’s harder. Going from Summit, it obviously goes gradually down, except for the very beginning. To begin the trek, you ignore the no pedestrian signs and hike across a flat expanse near the bottom of the ski run, and then up for just a tenth of a mile or so to the trail marker sign. Of course you can also do this trail as an out and back and get the joy of both the up and down. Beautiful creek in the forest. Very quickly after leaving the ski area, we were in the forest. The first part of the hike was fairly flat, with a few gently rolling hills. For me this was great because I could catch my breath after the short hike up. This part of the trail, being so close to the ski area, had more people on it than most of our hike. As we wandered further through the forest, we passed a few little creeks where of course I had to stop and take photos. They were so beautiful and I love to listen to the wind in the forest trees and the water rushing past. And if it’s also snowing on me, as it was that day, I’m pretty much in my perfect place. For most of the hike, we saw just the occasional cross country skiers or snowshoers. Once we even saw a couple of downhillers! That trail does cross another trail up to Timberline, so perhaps they came from there. I’m not really sure. It was just mostly us and the trees. It’s pretty amazing, actually. That trail cannot be more than a mile above town, if even, but you can’t hear ANY road noise at all. You feel like you could be 100 miles from a town. That’s the beauty of snow, I guess. Traps and muffles all the sound. It’s all physics, really. Keeping warm waiting for the bus! Once we got near the other end of the trail, we began to see a few more people again, but it was never crowded. I appreciated the downhill being at the end of our hike and was glad we hadn’t started at that end of town. Our hike ended up being somewhere between 3-4 miles, and we came out just across from the Best Western (there are a couple of other cut-offs that make the trail a bit shorter) on the opposite end of town, which also happens to be a bus stop for the Mt. Hood Express. Luckily, we’d packed hot cocoa in our Hydroflask and some peppermint schnapps in our regular flask, so we stayed warm while we waited the 15 minutes or so to catch our bus back. 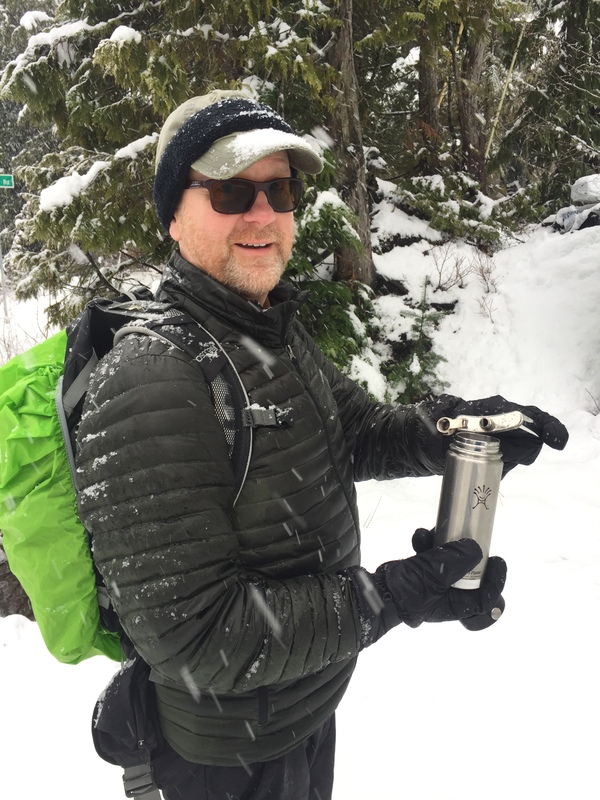 We love this snowshoe route, and we highly recommend it. It’s a great way to spend a snowy morning or an afternoon whether it’s during a week or a weekend. No Fireball? Looks like it was super fun. This seems like an exceptional trail which I would love to hike and enjoy the scenery there. How long does the Crosstown Trail take to hike? We’ve spent 2-3 hours on the trail each time we’ve snowshoed it. The last stretch is mostly downhill, but we’d recommend 2-4 hours for the entire length of the trail, depending on how fast you hike (and how many photos you stop to take! ).